Recently, Ready at Dawn released a new trailer and some screenshots for its upcoming highly anticipated game, The Order: 1886. The developer didn’t reveal much about the game after its initial showcase at E3 2013 but now, the developer has started to uncover information and details about the game. The latest details about the game reveal that the The Order: 1886 polygon count is over 100,000 for each main character of the game. Back at E3 2013, Sony announced a brand new IP called The Order: 1886 exclusively for PlayStation 4. Ready at Dawn and Sony Santa Monica were revealed as the developers of the game. 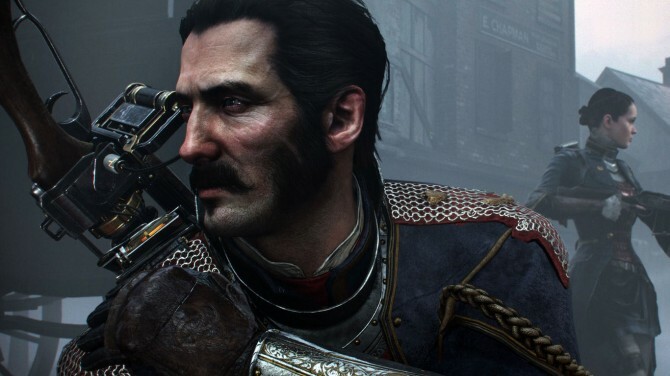 The Order: 1886 announcement trailer attracted a lot of gamers’ attention back then and the recently released game trailer has promoted the excitement even more. Fans are now looking for extra details about the game and the developer is not stopping from disclosing some. Just like Ryse: Son of Rome, The Order: 1886 will also render at 30 frames per second on PlayStation 4. The possible cause to low fps could be the high fidelity environments and rich in-game character animations. 30fps is more suitable for graphically richer games than 60 fps. Andrea Pessino, Ready at Dawn’s Co-founder and Chief Technical Officer, just clarified the complexity of The Order: 1886’s characters while responding to a fan on Twitter. Pessino revealed The Order: 1886 polygon count for each leading character of the game. According to him, main characters have over 100,000 polygons each, 250 joints just in the head and over 130 blend shapes in face. Pessino has boasted the environments and the textures of The Order: 1886 several times in past. He claimed that the actual gameplay of The Order: 1886 looks a lot better than the debut trailer that was shown at E3 2013, even Sony supported the statement by referring the game as a real life movie and saying that The Order: 1886 could prove to be more impressive than inFamous: Second Son. Comparatively, The Order: 1886 wins from Ryse in the aspect of character polygon count as Marius (Ryse’s protagonist) had 150,000 polygons that were reduced to 85,000 after a round of optimization. However, when it comes to blend shapes and head joints, Marius takes the lead as he has 230 blend shapes for the face, that’s 100 more than what The Order 1886 characters have. Marius also features 260 head joints. Prophet from Crysis 3 can also be considered as another highly detailed character, with 60,000 polygons. The Order: 1886 polygon count can’t be unchangeable. The game is currently in development so the mentioned polycount might change during optimization before the official release of the game. During development, a lot of rough polygons are not clearly visible, they are removed in the final polishing of the game.